Bill Shorten has been sitting on the fence regarding the Adani Carmichael coal mine. Well, it doesn't stack up according to any social justice morality, or on it's economics or according to environmental and climate criteria. In April Bill Shorten, interviewed for the ABC 7.30 Report, opposed the NAIF loan while hedging his bets on support for the mine. He said "I support the Adani coal mine so long as it stacks up. I hope it stacks up, by the way. But it's got to stack up commercially. It's got to stack up environmentally." I attended Bill Shorten's Moonee Ponds office to give him a message to stop sitting on the fence over Adani's Carmichael coal mine. I met with Bill Shorten with other members of civil society during COP21 in Paris, so he knows how serious climate change is, and how important it is to reduce emissions. The global coal market is in structural decline and it is time to manage the winding back of export coal (important for any just transition for existing coal mining businesses and workers) and ending fossil fuel subsidies. These are both important if Australia is to meet our fair share of the global target of well below 2 degrees warming enshrined in the Paris Agreement and demonstrate leadership on climate action on a global level. 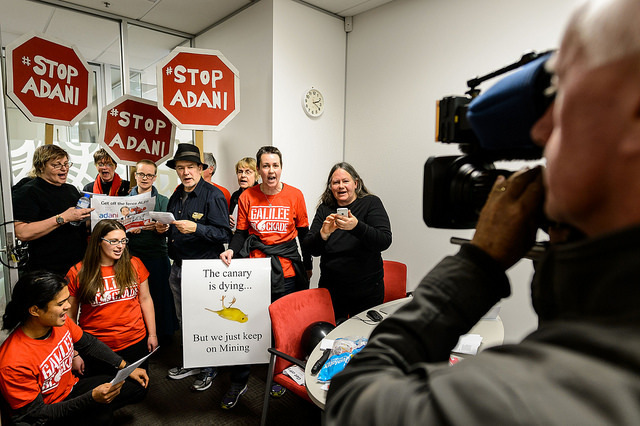 Shortly after 1pm dozens of peaceful Stop Adani climate activists occupied Labor Opposition leader Bill Shorten's electoral office in Moonee Ponds. Some occupied the office while more stood outside the building in a visual and (audio) display to passers-by with a wealth of songs and chants. While we were downstairs singing and holding up signs more people were peacefully occupying his offices all afternoon. About 3pm the protest downstairs concluded and we joined those upstairs. Negotiations started sometime with the police and Office Manager around 4pm. A meeting by three people with his chief of staff tomorrow was negotiated, and everyone left his offices at 4.45pm. No arrests. ABC and commercial stations attended to get a video clip. One of the occupiers was businessman Michael Staindl who said the Labor opposition was taking a "low profile" and "sitting on the fence" on the controversial mine project. "We need them (Labor) to take a much stronger stance on this," he said. He argued that the people of Queensland had been misled by the promise of jobs, and that the project would instead cost coal jobs elsewhere in Queensland and Australia. Staindl said he was happy to risk arrest to protest against the coal mine. "Ten years ago, I'd have never done something like this, but it's important and we need to focus on renewables not fossil fuels," he said, according to an AAP report on Yahoo7. We want Bill Shorten to stop equivocating and take a moral and ethical stand in opposing the Adani mine like fellow Victorian MPs Peter Khalil (Wills) and David Feeney (Batman). Shorten's environment spokesperson Mark Butler is very clear in saying that he doesn't think the mine stacks up on economics or environmental grounds. Shorten needs to lead instead of sitting on the fence. On Monday Angela, one of Shorten's constituents, gave to him two climate change reports to read. One of these is the recent report by David Spratt and Ian Dunlop on Disaster Alley, Climate change, conflict and risk, and the other is the Climate Reality Check report (PDF) from 2015. The occupation and stand off in the office ended peacefully after Shorten's Chief of Staff agreed to meet three activists for an hour long meeting on Friday. Those locked on, locked off. The banners, signs and black balloons were all picked up and the office left tidy. All the police called to the office (20 or so?) could go back to their regular duties. And the activists retired to the coffee shop over the road for a quick debrief. Watch Anthony Gleeson recite this powerful poem in Bill Shorten's office. Bill needs to take action for his own kids and grandkids and all of us.